The winter season in Alabama may be short and mild, but that doesn’t mean we’re not tired of the short and chilly days. 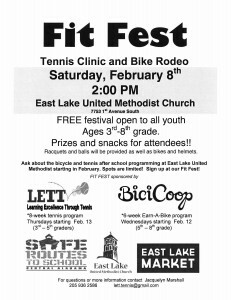 If you know someone between the ages of 3rd-8th grade itching to get out of the house and enjoy the sun despite the cold air, join us on Saturday, February 8th for Fit Fest: Tennis Clinic and Bike Rodeo! The festival kicks off at 2 PM at East Lake United Methodist Church at 7753 1st Avenue South. The festival is free and open to all youth in third through eighth grades. Get moving with fun tennis and bicycle activities provided by LETT (Learning Excellence Through Tennis) and Bici Coop. We’ll have the helmets and racquets, plus snacks and prizes – all you need to do is grab a water bottle and show up in comfortable clothes. 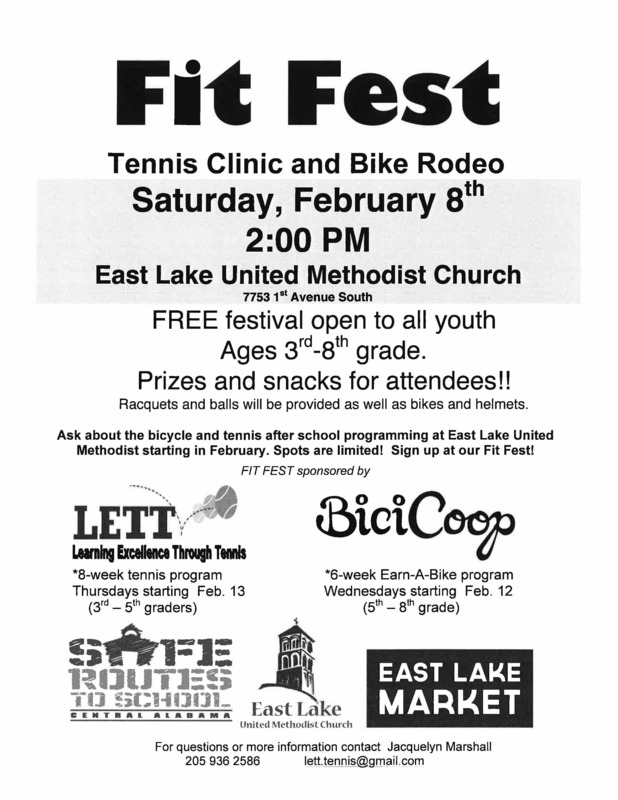 We’ll also be telling everyone about the bicycle and tennis after school programs at East Lake United Methodist that are starting in February. LETT is hosting an 8-week tennis program on Thursdays, starting February 13 for 3rd-5th graders. BiciCoop is hosting a 6-week Earn a Bike program on Wednesdays, starting February 12 for 5th-8th graders. Spaces are limited, so make sure to sign your kids up at Fit Fest. For questions or more information, contact Jacquelyn Marshall by email lett.tennis@gmail.com or call 205-936-2586.